Loss of teeth: replace them with implants or dentures? Toothlessness is a source or great distress both for functional reasons and for aesthetic reasons. A number of missing teeth can strongly impair the chewing function which in turn affects the muscles and the surrounding joints and tissues. Apart from the functional problems, the psychological discomfort that a missing tooth or teeth can provoke is undoubtedly a valid reason to consider its restoration. There are two main options for the restoration of missing teeth: the removable dentures or fixed implant supported dentures. Let's see what are the main characteristics of the two solutions. The main characteristic of removable dentures is certainly the possibility to remove them in each moment. Two are the main types: the removable full denture (that substitutes all the teeth of the single arch) and the removable partials (that substitute a few teeth). 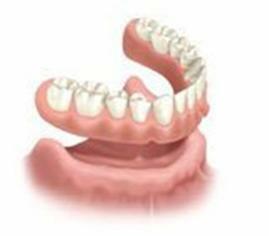 The denture is made of a mounting frame holding the prosthetic teeth, which is placed on the patient’s gum. The removable partial is made of various prosthetic teeth that fill the gaps where teeth are missing, and are anchored to the adjacent healthy teeth with metallic clasps. The cost. The price of the removable denture is considerably lower than the solution with the implant, and this is its main advantage. A non-invasive procedure. The placement of the denture doesn’t require a surgical procedure so this certainly represents a major advantage for those patients that suffer from dental phobia. The reduction of the jawbone. The bones, if not used, get reabsorbed. Since the movable denture is not anchored in the bone, it contributes to a gradual thinning and withdrawal of the bone. Likeness of inflammation. The movable denture exerts a considerable pressure on the gums and often causes pain and inflammation. Chewing problems. The denture is not completely fixed and sometimes wobbles during mastication, provoking discomfort. 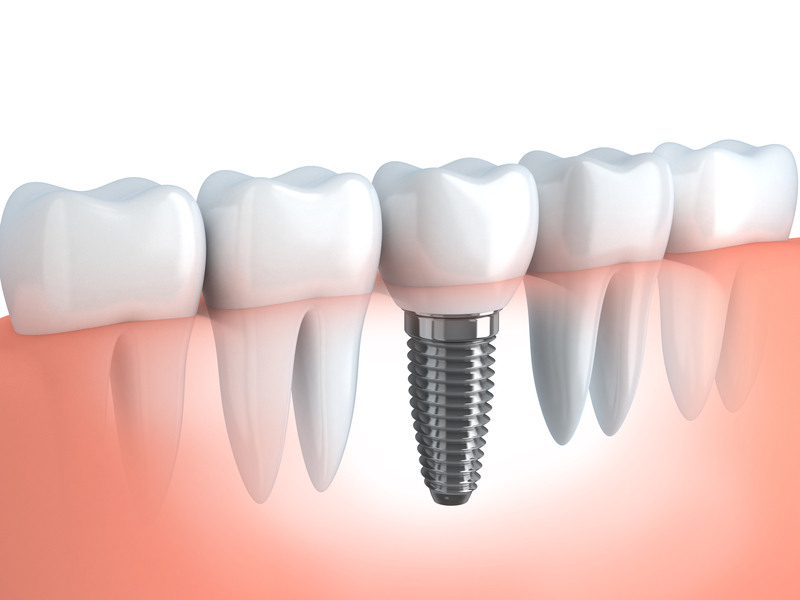 With dental implants it is possible to replace one or more teeth, up to the whole jaw. The dentures on implants are fixed solutions. A titanium post is inserted in the jawbone where teeth are missing, forming a rock-solid anchor for the prosthetic teeth. There are various possible solutions: an implant for a single tooth, a bridge on implants or a complete denture on implants. A method offering stability and strength. The implants are the most natural solution for replacing missing teeth. It is a lasting solution that guarantees stability and comfort. Also, once placed, the implants do not require any additional adaptation. They allow the bone to maintain its structure. 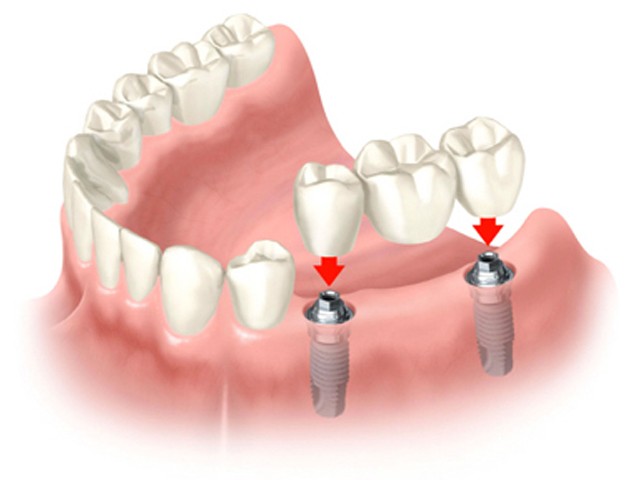 The screws replace the root of the tooth and so the gradual loss of the bone is avoided. The procedure. The placement of the implant require a surgical procedure. Even if it is completely painless thanks to modern anaesthesic methods, it could however cause fear to people who suffer from dental phobia. The cost. Compared to the mobile solution, the cost of the implant denture is considerably higher, which is its major drawback.